Our superintendent of schools, Susan Allen, challenged us to rethink how technology is used for instruction in our district. She wanted us to see and learn from some of the best schools in the nation, and suggested visiting the schools included in the National School Boards Association (NSBA) annual Technology Education Site Visits. 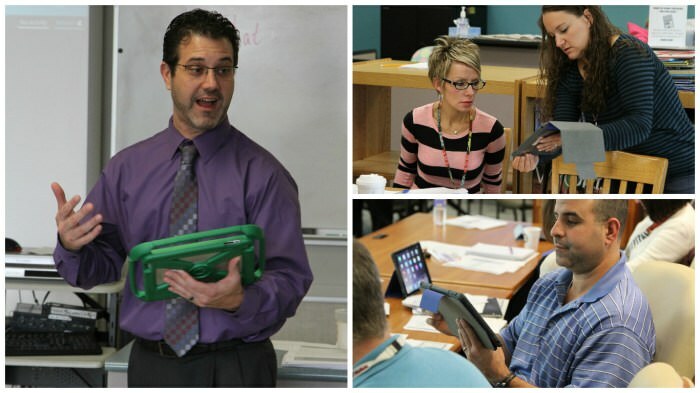 These schools are chosen by the NSBA for their thoughtful and successful approaches to integrating technology. Ann Flynn, NSBA's Director of Education Technology and recent Top 30 Technologists, Transformers & Trailblazers Award winner, writes here "about why education technology site visits are important to allowing educators to grasp the essential conditions needed to support technology innovation." 2012-13 - Vancouver Public Schools. Saw first hand how instructional technology had permeated the classrooms in this district, and learned about the impressive work of the ProjectRed consortium. It was here that we first heard about the work being done in Mooresville, NC. We contacted Mooresville and asked if we could visit, and they put us on their waiting list. A year and a half later (yes, the waiting list is that long) it was our turn to visit. 2013-14 - Vail School District. Learned about their impressive work developing a textbook-free environment for many of their students (Beyond Textbooks), which they have shared with over 100 partners in Arizona, California, Idaho, and Wyoming. At the time of our visit they were in their 9th year of a 1:1 implementation in one of their High Schools. In addition to seeing how their classroom practice had shifted with their thoughtful technology integration, we also learned about many of the logistical challenges inherent in a 1:1 deployment. 2014-15 - Mooresville Graded School District. Everyone who visits Mooresville is likely to say the same thing ... "We went to see their technology integration, and left talking about their culture." This district has created a blueprint for what they call digital conversion, and is willing to share everything. It was the inspiration for our own journey down this path. 2014-15 - Kent School District. Saw many remarkable examples of technology integration throughout this very large district (over 27,000 students), including 1:1 deployments. Phenomenal work being done in this district, which is leaving no stone unturned. One example of this is their determination to get wireless internet access to students who do not have it at home. They partnered with their local internet service providers to have kiosks installed in local businesses so students and parents could access the district WiFi network.